Anja Wolkenhauer was educated at the universities of Hamburg and Florence where she studied Classics, Art History, and History of Sciences after having gained several years of work experience as an antiquarian bookseller. In her doctoral dissertation, „Zu schwer für Apoll. Die Antike in humanistischen Druckerzeichen des 16. Jahrhunderts” she offered a new basis for exploring early modern advertising strategies. Her second book “Sonne und Mond, Kalender und Uhr“, (2009) scrutinized the mental history of timekeeping in Rome. 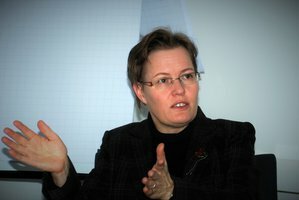 In 2010 Anja Wolkenhauer was appointed Chair of Latin Philology at the Eberhard-Karls-Universität Tübingen. She is one of the directors of the postgraduate programme “’Other’ Aesthetics - Aesthetic Figures of Reflection in the Pre-modern Age” and one of the editors of Spudasmata and the Wolfenbütteler-Renaissance-Mitteilungen. In 2015 she was also elected Chair of the “Arbeitskreis Renaissanceforschung” at the HAB Wolfenbüttel.